How many cooler case sandwiches do you think they have for sale at Walgreens? Some of the dingiest gas stations in town carry four or five, so I figured Walgreens, with its wall of well-stocked coolers, would have about 15 to pick from. I was wrong. Not counting burritos (and what deranged Sandy Soul would? ), my local Walgreens offered a measly two sandwiches. Given that I was buying groceries at an establishment specializing in selling sub-WalMart quality plastic crap (i.e., the shambled remains of my $6 shower curtain), I was clearly in a desperate, lunchless situation. I had to choose one of the sandwiches. 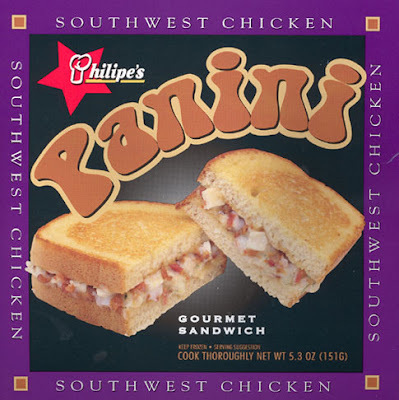 Both were Philipe's-brand frozen paninis (panini, for you damned Italian sticklers). I've been impressed in the past by what silver grilling surface technology has done for microwavable foods (e.g., Lean Cuisine paninis, Bagel Bites, etc. ), so I had somewhat high hopes for this sandwich. "I like paninis," I thought. "How bad could it be?" But the brand concerned me. I was unfamiliar with Philipe's work, although his Web site insists his products are sold at all 7-Eleven and Walgreens locations. Now let me tell you about the Philipe's Food Station. For $947, you can buy your very own Philipe's Food Station. If Philipe's so-called panini hadn't been so disappointing (more on that later), I would want one of these. For the same approximate price of a PlayStation3, you get a 2-by-2-by-4-foot money making machine featuring a freezer and an microwave "decorated in the trade dress of the Philipe’s brand." The only catch appears to be that you must own a convenience store — apparently you can't just buy one for your rumpus room. That's too bad, because along with featuring a sharply branded, self-contained frozen food dispenser and cooker, this baby will make you two grand per year, assuming you sell enough paninis. You could take that money and buy two PS3s! To learn more or to order a food station, download this pdf. And now the review. This sandy was bad. One immediately obvious problem was that this was by no means a panini, despite the gigantic letting on the box suggesting otherwise. What it was exactly it hard to say. There's no name for this combination of food. I suppose it's similar to other foods I've seen. It was kind of like two pieces of Texas toast with a bit of meat and cheese on top. An even closer comparison would be to bruschetta, given its size and layout and the bread's crispiness. But do not offer a Philipe's Panini to an Italian and call it bruschetta; he will immediately punch you in the face or, if armed, stab you. I ate the damn thing with intentions of reviewing it for the sandyblog and look, I'm doing it it. But it's hardly a sandwich ... unless you call it an open-face sandwich. But would you call a piece of bruschetta an open face sandwich? God I hope not. Back to this review. The meat was varied and strange and the cheese was bad. The overall taste was reminiscent of a college-era toaster-oven pizza-bagel using the cheapest mozzarella found in the store. This thing was also not what was pictured on the package. The box promised a sandwich — two pieces of bread, filling, sliced in half. If I smashed the pieces within the box together it would have been closer to the reality of this abomination, but still wholly unsatisfying. Philipe's bummer offering gets a bonus half-sandy for its surprising southwestern kick. I believe it came from the jalapeño powder chipotle chile pepper found within the ingredients list. The zing was welcome. Thanks for that at least, Philipe. I'll grant an additional half-sandy for the excellent illustration on the back explaining how to cook the thing, which was actually a more accurate representation of what the paninis looked like. Oh my god ... hilarious. Somehow I missed that. I wonder if that's intentional in a Joe Camel kind of way, or if Philipe's logo guy (maybe Philipe himself? seems like a small operation) is terribly unobservant.